Why do we need Community Innovation Labs? In this time of rapid change, our country faces deep divisions and unprecedented cultural challenges. 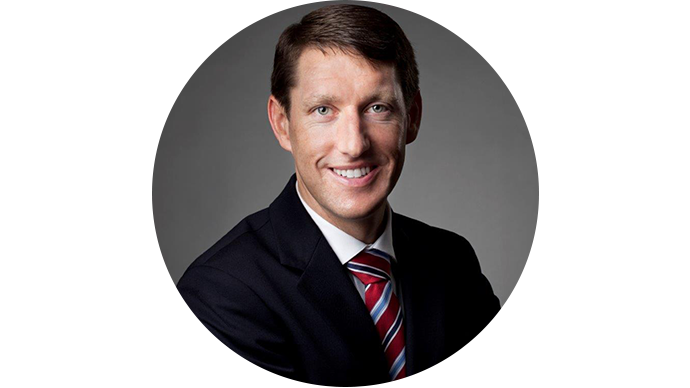 Despite our best intentions, we’re getting it wrong so often these days – still applying military metaphors (targets, precision, efficiency) to situations that are complex and fluid, unknowable and ambiguous. We’re holding ourselves back by relying on best practices and linear strategic planning, which limit our ability to discover the next practices of the future, or tackle anything other than symptoms. Authored by Richard Evans and Karina Mangu-Ward, this article in the GIAReader, Vol 26, Fall 2015 provides provides a comprehensive overview of the research, practice and frameworks of Community Innovation Labs. The Community Innovation Labs are our response to what we see today. They are an unconventional approach to helping community stakeholders from multiple sectors work together in to address to an urgent and specific social challenge. 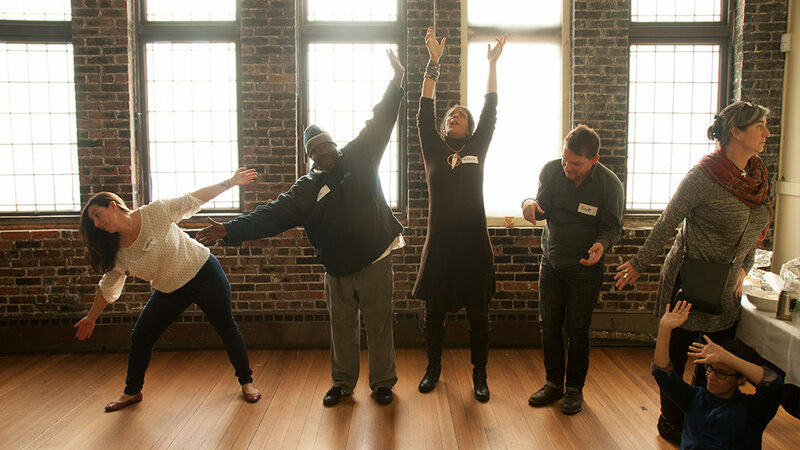 The Labs use artistic processes to build trust, explore new possibilities, and advance arts-based strategies for systemic change. If we can do this, it seems to us, our communities will make real progress toward justice, equity and creative vitality. To learn more about Community Innovation Labs, contact Liz Dreyer at ldreyer@emcarts.org. 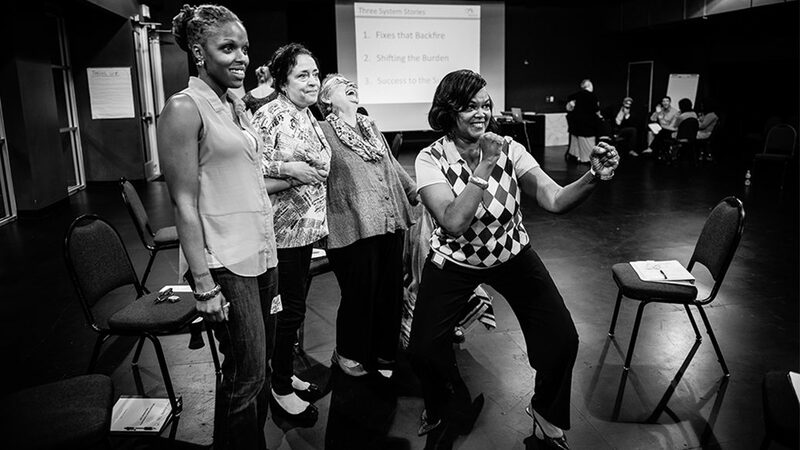 The Community Innovation Labs are a 15 to 24 month program that uses the arts to bring together diverse, cross-sector groups of stakeholders in a city or neighborhood in order to take on a self-determined community challenge. Participants include city agencies, community organizers, business leaders, artists, cultural organizations, and nonprofit service providers. To date, Labs have been held in Providence, RI, Winston-Salem, NC, and Dallas, TX, and a new Lab focused on Inclusive Economies is currently underway in Indianapolis, IN. EmcArts works with local Conveners to customize the Lab design to the local context, clarify the focus, engage local artists, recruit local Champions, and enroll larger groups of Lab Members. Research is conducted to gather perspectives from local stakeholders. EmcArts facilitates a series of carefully crafted Intensive Workshops for a core group of 30-40 Lab participants, as well as a series of additional community gatherings to engage a larger cross-section of local stakeholders and influencers. 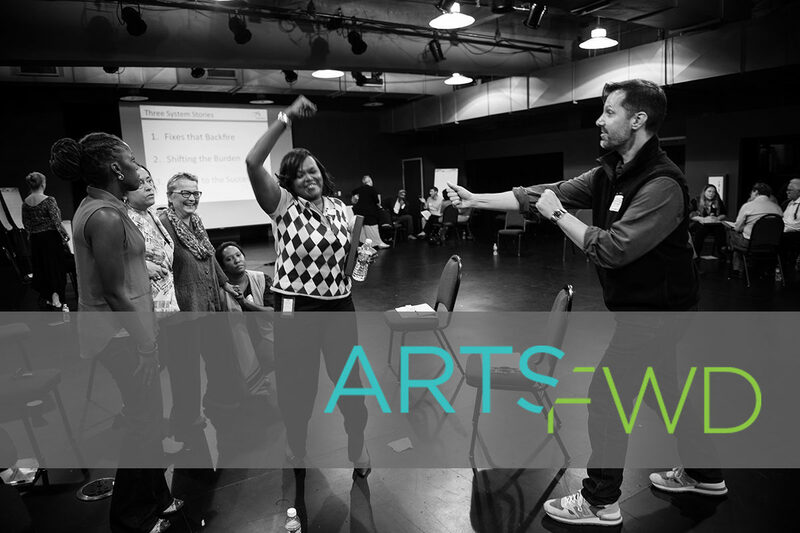 Workshops are richly interwoven with artistic facilitation techniques and move participants towards transformative, arts-based strategies for change. 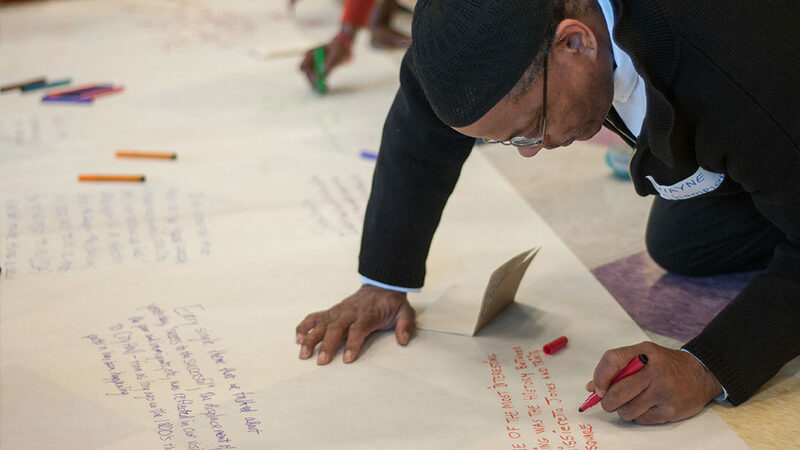 Up to three cross-sector working groups that emerge from can opt in to further facilitation support from an EmcArts team member to foster an emerging arts-based strategies, maintaining momentum and pivoting towards testing strategies in action. 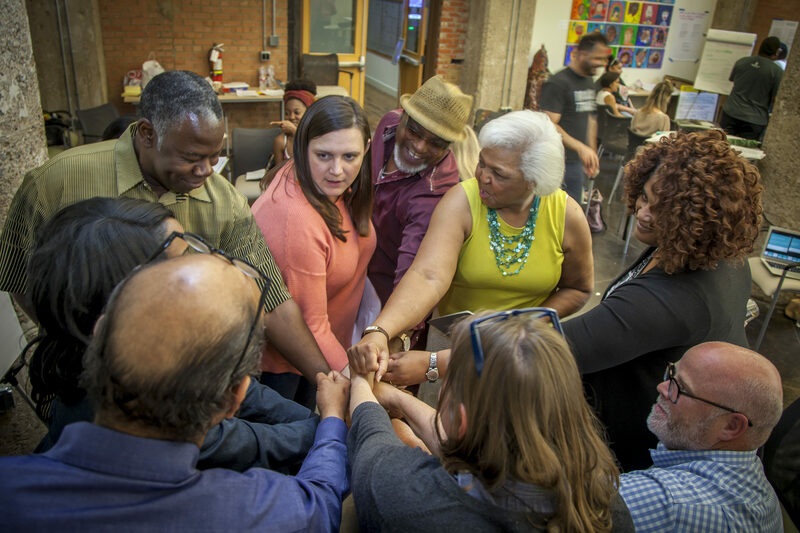 At its core, the Winston-Salem Community Innovation Lab is a social-capital building initiative that has created safe spaces for brave, healthy, and challenging dialogue and meaningful connections between diverse members of our community. Dallas Lab participants gather to celebrate progress. Photo by Kim Leeson. Winston-Salem Lab participants performed skits about common pitfalls of systems. Photo by Christine Rucker. Providence Lab participants created tableaus of local challenges. Photo by Dilan Alvarado and Jose Navarro-Robles at AS220 Youth. 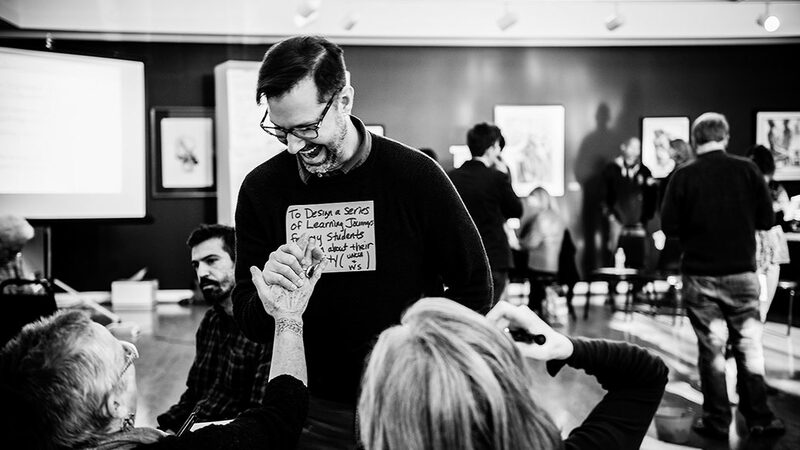 Geordie MacMinn, Lead Artist Facilitator of the Winston-Salem Lab gets high fives for his community action idea. Photo by Christine Rucker. Providence Lab participant writes down his most salient take-away from his Learning Journey. Photo by Dilan Alvarado and Jose Navarro-Robles at AS220 Youth. Core funding for the Community Innovation Labs is provided by the Kresge Foundation and MetLife Foundation.